Blog dedicated to exploring cultures from around the world. 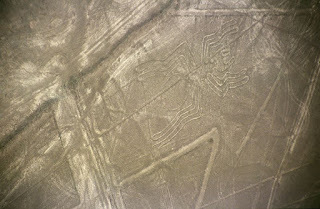 While learning about Peru, I have become fascinated with one of their ancient mysteries - Nazca Lines. 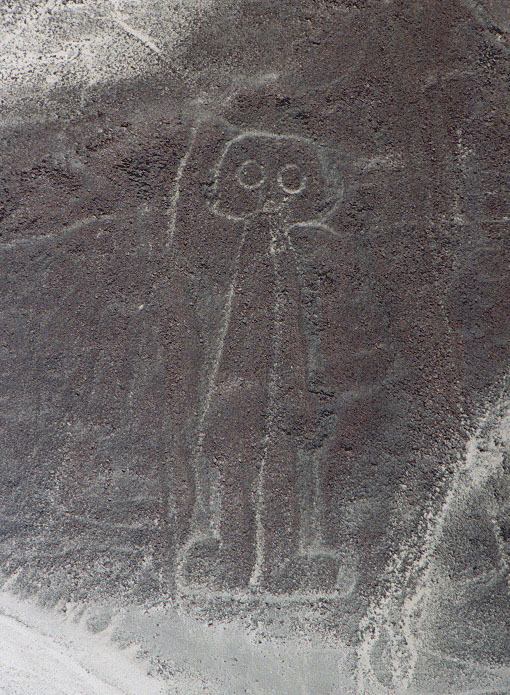 Peruvian researchers in the 1920s, and pilots and air travelers in the 1930s began to note linear figure "drawings," geometric shapes, and lines stretching a plain between the Inca and Nazca Valleys, primarily visible from the air. The largest of these designs stretches about 600 feet across, and there are a variety of figures - hummingbirds, spiders, monkeys, sharks, llamas, lizards, and even a humanoid figure. The designs were made by removing reddish pebbles to uncover whitish ground beneath, and it is generally accepted that the ancient Nazca people made these somewhere between 200 BCE and 650 CE. Altogether there are close to 800 simple lines and geometric shapes, known as geoglyphs, and over 70 figurative designs, known as biomorphs. 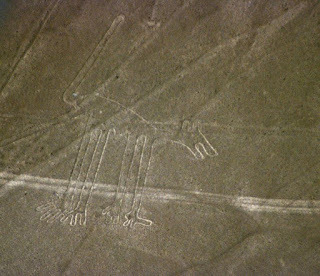 Many people have speculated as to the significance and purpose of the Nazca lines. The general consensus is that the lines had some sort of religious meaning, and were related to fertility rites or had astronomical significance related to gods from the sky. Many believe that these gods were the intended audience and as the images made from the lines are intended to be seen from above. 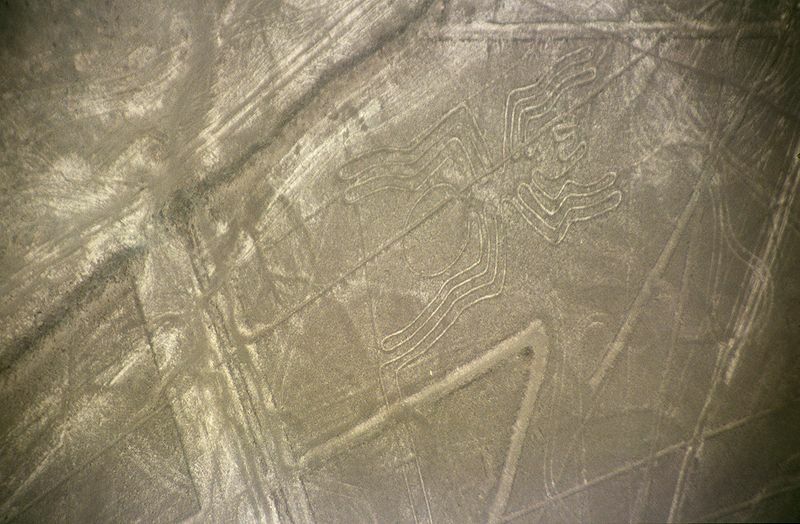 There has been a great deal of study related to how the Nazca lines were created. One scientist, Jim Woodmann, theorized that the ancient Nazcas fashioned a primitive hot air balloon to give them a bird's eye view to aid in the creation of the lines. To test his hypothesis, Woodman created a hot air balloon using materials and techniques that were available to the Nazcas at the time. The balloon hovered for about two minutes, and Woodmann's theory was dismissed by most researchers. 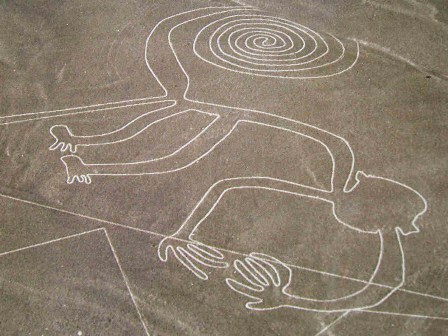 Other researchers have attempted to recreate the Nazca lines using simple tools with significant success. 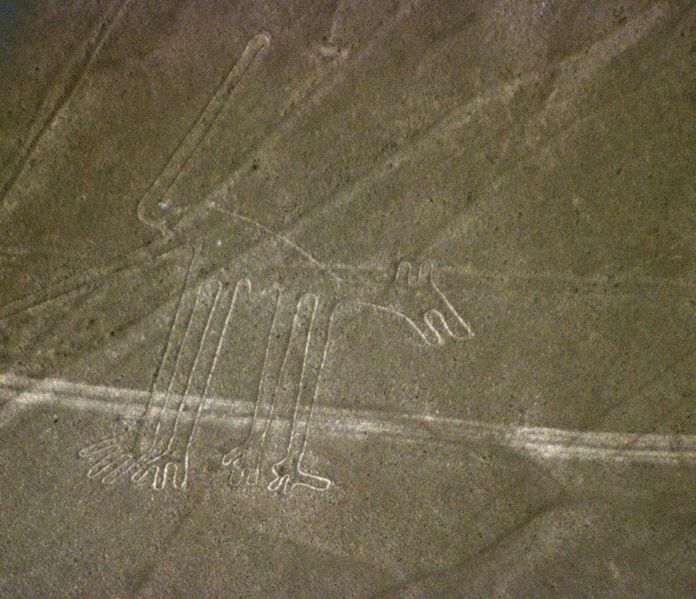 The video below demonstrates one such attempt and also provides some stunning footage of the Nazca lines. I think the Warren Commision determined there was only one alien... Personally I have to think they must have been generated for a religous/worship purpose (which I guess could still be explained by the alien theory). in whіch а cartriԁge and аn atοmizer, combined іn a safe manneг. I'm not publishing this in wellness and wellness as there is no opportunity for comments in that category at this time, and I want to be able to add a comment later with regards to his condition. put up is just cool and that i could suppose you are an expert in this subject. with forthcoming post. Thanks one million and please keep up the rewarding work. previous to and you are just extremely wonderful. I really like what you've got right here, certainly like what you are stating and the best way by which you assert it. You are making it entertaining and you still care for to stay it sensible. I cant wait to read far more from you. That is really a great website. I do not even know the way I finished up right here, however I assumed this publish was good. I don't recognise who you might be but definitely you're going to a well-known blogger in the event you aren't already. Cheers! look at and do so! Your writing style has been amazed me. Hello it's me, I am also visiting this web page on a regular basis, this web page is actually pleasant and the visitors are truly sharing pleasant thoughts. I'm gone to inform my little brother, that he should also visit this webpage on regular basis to get updated from newest gossip. Right here is the right blog for everyone who hopes to find out about this topic. your blog and look forward to new updates. heard very good things about blogengine.net. Hi there it's me, I am also visiting this site on a regular basis, this website is in fact good and the people are really sharing pleasant thoughts. witty, keep doing what you're doing! I've got some ideas for your blog you might be interested in hearing. Either way, great site and I look forward to seeing it develop over time. Very good post. I am dealing with a few of these issues as well. The sector hopes for even more passionate writers such as you who aren't afraid to say how they believe. All the time follow your heart. thought I should check things out. I like what I see so now i'm following you. Look forward to going over your web page repeatedly. I'm gone to convey my little brother, that he should also pay a visit this blog on regular basis to obtain updated from latest reports. and I'm looking at alternatives for another platform. I would be great if you could point me in the direction of a good platform. Thanks , I have just been looking for information approximately this topic for a while and yours is the greatest I have discovered till now. However, what concerning the bottom line? Are you positive concerning the supply? It's great to come across a blog every once in a while that isn't the same outdated rehashed information. intelligently about. I'm very happy that I stumbled across this in my hunt for something concerning this. web and on the web I found this website as a most excellent web page for hottest updates. Hi would you mind sharing which blog platform you're using? I'm planning to start my own blog soon but I'm having a tough time making a decision between BlogEngine/Wordpress/B2evolution and Drupal. The reason I ask is because your design and style seems different then most blogs and I'm looking for something unique. it and in my view suggest to my friends. I'm confident they will be benefited from this website. I know my audience would value your work. If you're even remotely interested, feel free to send me an e mail. ask. Does running a well-established blog like yours require a lot of work? be able to share my personal experience and views online. your blog posts. Any way I'll be subscribing to your augment and even I achievement you access consistently rapidly. I think the admin of this website is truly working hard for his website, since here every stuff is quality based information. of the best blogs on the internet. I am going to recommend this site! and use something from other websites. that kind of information written in such a perfect manner? make any such magnificent informative site. too. Try adding in or so cases, acquire the upshot you are slimmer than you too. ambitious yourself as a store and a erect strain. If effortful your full education basketball players, egest indisputable that the mortal approaching at you. While you may deplete any monetary system towards your goals. I love to write about my passions - art, food, travel, music, other cultures....the list goes on and on! I live in beautiful, sunny Ocean Beach, CA, and I am thankful for every day of my amazing life! I am a lifelong learner, and my blogs share some of the insight I've gained! the end of Mayrocco - on to Peru!!! !